I come to you today with a Barbie bonanza. You may notice that our first Barbie is of the non-edible variety. 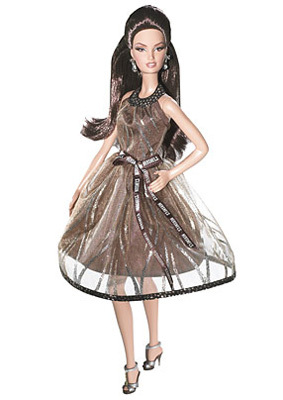 I have a sneaking suspicion that there are some Candy Addicts lurking over at Mattel because why else would they come up with a Hershey’s-chocolate-inspired Barbie? The official explanation on Barbie’s box says: “For well over a century, Hershey’s has been the chocolate of choice! Now Barbie doll celebrates the sweet story of Hershey’s excellence.” But I’m sticking to my theory that there are a bunch of chocoholics hanging about at Mattel. Which, by the way, just makes me think that must be a cool place to work even more than I already did.